A few years ago I wandered into the Wolf Bar in Carlton and was enveloped in the warm and heady nostalgic aroma of mulled wine. It shot me straight back to university days in the 70s and 80s, and every June since has seen me reaching for cloves, cinnamon sticks and red wine. I just love this time of year: the satisfaction of a major clean and tidy up in the garden, planting for spring with all the hopes and promise ahead, the camellias in bloom and debating squeezing in just one more gorgeous tree only available in the bare root season. It may be getting chilly, but now I have my mulled wine. Read on! This is it – bare root season is finally here. The nursery staff have been beavering away re-arranging stock ready for the thousands of bare root plants which arrive in June. This is one of the busiest and most satisfying times of the year for us. There is constant traffic through the nursery and we answer hundreds of questions on planting, varieties, pruning, cross pollination etc. It is deeply satisfying to see customers deciding on their favourite plum tree, or going a bit more adventurous with a duo or even trio planting. We now have an astounding array of dwarf varieties compared to even 3 years ago. Growers are responding well to the increased demand for smaller trees and I suspect it will only be a few more years when most grafted fruit trees will be available in a dwarf form. Click here to read our Bare Root Tree Planting and Pruning Guide. Think of what fruit you love to eat and then see if it can be grown in your climate. Now is a great time to plant as the greatest range is available and sold as bare-rooted fruit trees. There are many common and uncommon varieties of apples and pears, cherries and apricots, peaches, plums, nectarines, nuts, figs, mulberries etc – in fact, a veritable cornucopia of fruit trees for the suburban garden. Your garden need not be large to grow delicious fruit: many varieties are suitable as potted plants in large tubs, making them an ornamental as well as edible feature. If you have a bare fence, train a tree as an espalier. Some need to be cross-pollinated in order to get a crop. In this case, there are multi-grafted fruit trees available; or, use the trick of duo or trio planting – we have duo planted plums demonstrated in the nursery – two trees in the space of one. In the vegetable garden it’s time to plant runners of delicious strawberries and crowns of asparagus and rhubarb. Find a place in your garden where they won’t need to be disturbed and, in the right conditions, these will all give you years of produce. Other seedlings you can plant now include onion, beetroot, radish, silverbeet, lettuce and spinach. Bare-rooted ornamental trees and roses are available and ready to plant now. Even though they are bare-rooted, they have been potted up for ease of transport and to prevent the roots drying out if you don’t get a chance to plant them immediately. Check out the huge range of camellias in flower. Look out for other winter flowering plants like cyclamen and sweetly scented daphne or viburnums to brighten the garden during colder weather. There are lots of seedlings to plant now and enjoy in the coming months. Plant seedlings of pansies, violas, poppies, polyanthus and lobelia for long lasting colour. This is the perfect time of year to create any new garden beds and to improve the soil in existing garden beds. Add plenty of compost and manures, digging through the soil in new beds. For existing beds, simply add a generous layer to the surface around the plants, making sure the stems are clear of mulch or compost. 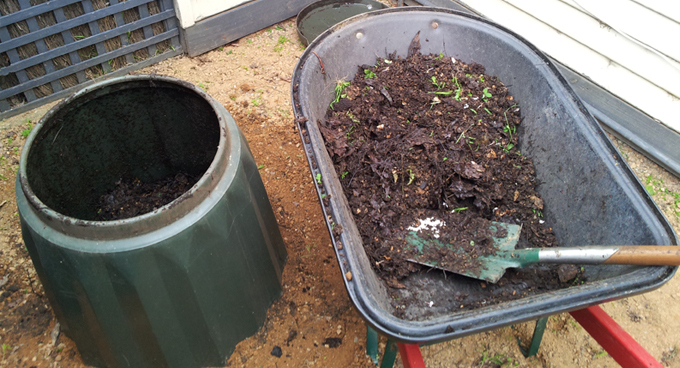 Remember to scrape mulch back off garden beds before adding the compost. You can leave the mulch off until early spring; or, if the soil underneath is moist, then the mulch can go back on top. If needed gypsum and lime can be added to the soil now as the rain will water it in. (Do not add lime to acid-loving plants, such as azaleas and camellias). If you have any extra space in your vegie patch, or if you are resting a bed as part of your crop rotation system, then winter can also be a chance to feed beds for spring planting with a crop of green manure. Green manure consists of legumes which capture the nitrogen in the air, and convert it to nitrogen in the soil. This is advantageous as vegetables need a lot of nitrogen. Dig the green manure back into the soil just before it goes to seed, then you can plant your spring crop in the same bed after 1 month. You can apply some to bulbs if they are shooting now. Cymbidium orchids may be fed with a slow-release food, or with some weak liquid fertiliser every three weeks or so. Sometimes our gardens grow differently to how we anticipated when we first set them up. Overcrowding and over-shadowing means that many plants may not be doing as well as they once were. Now is an ideal time to be moving many plants that you think are in the wrong position in the garden. Doing it over the cooler months allows the plant to put on new root growth and become better established before the stress of the summer. Perennials may be dug up and divided now. Roses and other winter dormant plants and trees can be pruned before moving, which makes it easier. Evergreens can be transplanted without pruning. There will be some natural dieback in some branches where you have upset the roots, and this can be trimmed off later. As always, it is best to prepare the site that you are moving the plant to before you start digging up the plant. This can be done by digging a hole for the plant, and adding organic matter such as composts and manures to the soil you have removed. Check the drainage of the hole by filling it with water and seeing how long it takes to drain away. If water sits there for too long then you may need to plant in a raised mound above the topsoil to allow for good drainage. If you are well-organised, the best way is to dig a deep trench around the plant about a month before the moving time, as far out as you are able to go. This will cut off some of the existing roots. Then backfill the trench with soil again. This allows new roots to develop around the severed rootball before the move. When the time comes for the move, water in plant starter before moving to help reduce transplant shock. Use the original trench as a guide to then dig out the plant. When digging them out, try to keep most of the root system intact; however, if roots need to be cut, use secateurs to prune cleanly. If the root ball is very large and heavy, you can hose off some of the excess soil before moving. This way you can also see and clean up roots that have been hacked badly. Water in well and use plant starter again after the move to encourage healthy root growth. Some plants do not take kindly to being moved, such as many of the native and indigenous species, in which case it would be better to start with new plants, as they grow quickly, than risk moving an established plant. Cut back autumn flowering herbaceous plants such as Asters and Chrysanthemums. Picking sprigs of daphne flowers and enjoying their perfume inside is a great way to prune your shrub. Now is the ideal time to prune deciduous shrubs. Prune out dead and diseased wood and any old unproductive shoots. Shorten the remaining shoots by one third unless they are spring-flowering. You can wait until July to prune your roses. Spray fruit trees & roses (when the leaves have fallen) with White Oil to destroy over wintering insect and mite eggs. The oil works by suffocation so it is important to get good, even coverage. Clean up any old fallen leaves, twigs and old fruit lying around fruit trees. This material is the potential source of many diseases, so if the tree was diseased in the last season dispose of this material, otherwise it may be composted. Similarly clean up around rose bushes removing any old leaves and old prunings. The temptation is to hibernate and allow the kids to do the same. Instead, keep them warm by some mucking about outside. Rake up the last of the leaves and let them play (or help you). Lay the leaves in garden beds and sprinkle manure over to help them break down. If it is raining, go for a walk in the rain. Don some gumboots, a raincoat and an umbrella and enjoy the sensation.